In some young children who develop type 1 diabetes, a change in normal stomach bacteria can precede the disease by a year, a small study has found. The findings, published February 5 in the journal Cell, Host & Microbe, are based on just 33 children at increased genetic risk of type 1 diabetes. And experts stress that it’s too early to tell what it all could mean. But one hope is that the results will lead to an early diagnostic test for type 1 diabetes, said researcher Aleksandar Kostic, a postdoctoral fellow at the Broad Institute of MIT and Harvard. There is also the possibility of developing new therapies for type 1 that would target the “ecosystem” of the gut, he said. Type 1 diabetes differs from the much more common type 2 diabetes, which is often linked to older age and obesity. In type 1, the immune system mistakenly kills off pancreatic cells that make the blood-sugar-regulating hormone insulin. To survive, people with type 1 have to take frequent injections of insulin, or use an insulin pump, for the rest of their lives. As many as 3 million Americans have type 1 diabetes, according to the JDRF (formerly Juvenile Diabetes Research Foundation), a New York-based organization that funds research into the disease. Often, the disease arises in childhood, but there are adult-onset cases, too. Scientists do not know exactly what causes the abnormal immune reaction. But people who carry certain gene variants related immune system function have a higher-than-normal risk of developing type 1 diabetes. By age 3 years, four children had developed type 1 diabetes. Ant those children showed a clear change in gut “bugs” about one year before the onset of the disease. “What we saw were huge alterations,” Kostic said. “That included a drop in the overall diversity of the community.” Children who went on to develop diabetes showed a decline in “good bugs” that produce beneficial fatty acids, and an increase in organisms linked to inflammation, Kostic explained. Type 1 diabetes in an autoimmune disease. Like Hashimoto’s thyroiditis, RA, Crohn’s disease and MS, the immune system turns upon the body, attacking specific cell types. In MS, the immune system attacks the myelin sheath that protects the nerves of the body, in RA the attack targets the connective tissues around the joints. Please go back to my blog “2014 in Review” posted on December 29, 2014. There are 5 additional blogs listed on gut microbes for your review. Changes in gut microbes are a part of the puzzle. The bigger picture is leaky gut – the breakdown of the gut lining that allows microbes and partially digested food particles to migrate into the blood stream. Once these foreign particles are in the blood stream, the immune system attacks them as a part of its normal function. However, through a process called “molecular mimicry” the immune system then turns to attack specific tissues in the body that resemble these foreign particles and an autoimmune disease is born. A viral or bacterial particle having as little as 5 amino acids in sequence is enough to spark an immune response. The same is true for protein particles. Amino acids are the building blocks of the body but only single amino acids are supposed to be absorbed from the gut. Carbohydrates as small as disaccharides (two simple sugars linked together) will also stimulate an immune response. The monosaccharides (single sugars) – glucose, galactose, and fructose are the only sugars that are supposed to be transported into the blood stream. Disaccharides, like lactose, sucrose, and maltose are common in the diet but need to be broken down into monosaccharides prior to absorption. I have long suspected that the introduction of dairy products and grains into infant’s diets before their gut matures is a significant factor in the onset of autoimmune disease. 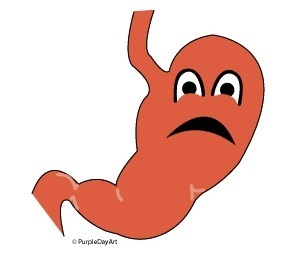 Autoimmune disease is triggered by poor digestive health. Disturbances in the microbiome and health of the gut lining must be evaluated and treated as needed with folic acid, pre and probiotics, and sometimes parasite killers.